Sometimes we have to wonder what people mean when they call themselves Christians. So much is said and done today, and has been across the centuries, by those who identify themselves with the Lord with their words, but not with their deeds. As a guard against self-righteousness, we must criticize ourselves first along these lines, not others. If the spiritual of disciplines taught us nothing else this Lent, they should have made clear how hard we find it to deny ourselves for the sake of the Lord and the neighbors in whom we encounter Him. Unfortunately, we usually find it far more appealing to worship ourselves than the One Who offered Himself fully on the Cross for our salvation. To follow Jesus Christ to His Cross requires what is not appealing at all, for we must take up our crosses and die to self. How much easier it is to worship the false gods of this world—such as power, pleasure, and wealth—than to join ourselves to His Self-offering “on behalf of all and for all.” How much easier it is to hail Christ as a conquering King when we think that He has come to give us everything that we want on our own terms. How subtle the temptation is to look to Him for the blessing of whatever we happen to want, which we assume must be holy and good simply because we want it. The crowds in Jerusalem on Palm Sunday longed for a new King David to give them what they wanted by defeating the Romans militarily and establishing an earthly kingdom. In the short space of a few days, however, the same crowds that called out “Hosanna!” would shout “Crucify Him!” once it became clear that this Messiah was not interested in giving them what they desired. He came to save the world, not to satisfy the wishes of any group wanting to use religion to gain power over others. Holy Week is not about getting what we want; it is not even about our prayer, fasting, almsgiving, or repentance. It is, instead, about the Lord Who purely out of love for us took upon Himself the full consequences of our enslavement to the fear of death in order to deliver us through His destruction of Hades and glorious resurrection on the third day. The One Who spoke the universe into existence submitted to being nailed to the Cross and left to die as a despised blasphemer and traitor. He mourned for us all when He wept at the tomb of His friend Lazarus, before raising him up. Then He Himself condescended to enter into the tomb as a corpse, as one of the countless dead, in order to bring Adam and Eve into the eternal joy for which He created them in the first place. He lowered Himself in order to raise us up to the Kingdom of Heaven. The crowds on Palm Sunday were right to shout “Hosanna! Blessed is He Who comes in the Name of the Lord, the King of Israel!” But they were wrong to think that His kingship was of this world and according to the standards of earthly princes, politicians, and military leaders. 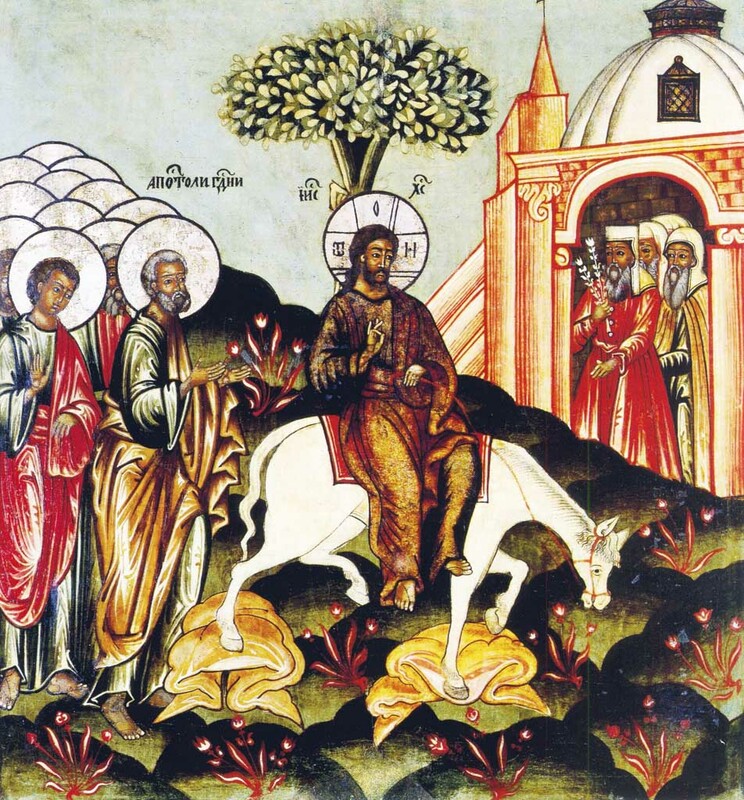 The Savior entered Jerusalem on a humble donkey. He did not respond in kind to the attacks upon Him, and He certainly did not tell the powerful or anyone else what they wanted to hear. He did not gather an army or strategize on how to become popular or influential. Instead, He freely offered Himself as the Passover Lamb in order take away the sins of the world and deliver us from death. He did not bring suffering upon others, but entered into it Himself. In order to follow Christ to His Cross and empty tomb, we must disorient and inconvenience ourselves this week. We must get out of our usual routines and go against our ingrained habits and preferences. 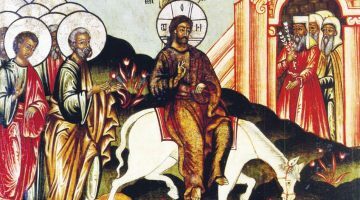 As much as possible, we must turn away from slavery to our earthly cares in order to focus on “whatever is true, whatever is honorable, whatever is just, whatever is pure, whatever is lovely, whatever is gracious.” As St. Paul put it, “The Lord is at hand.” This week is the time to refuse to abandon Him as He suffers and dies for us. It is the time to do the very strange thing of following a Lord Who looks like a complete failure and disappointment according to conventional expectations. But it is precisely through His apparent weakness that the Savior manifests a strength that vastly overwhelms even the worst that the corrupt powers of this age can do. For He rises triumphantly over them on the third day. This coming week is the time to unite ourselves to Christ as He offers Himself in free obedience for our salvation. We celebrate His entrance as the Messiah into Jerusalem today not in the sense of welcoming a new earthly ruler, but as the One Who opens the eternal blessedness of the Kingdom of God to us all. He does so not simply as a great spiritual teacher or religious leader, but as the eternal Son of God Who spoke the universe into existence. Not even the Cross, not even Hades, not even the tomb, can hold Him captive. Because of the great profundity and mystery of the Lord’s Passion, it will take time and energy for us to open our hearts to Him this week. Our faith does not concern abstract ideas that we can grasp in an instant, but requires true spiritual knowledge and experience in which there is always infinite room for growth. In order for us to embrace more fully the deep truth of Holy Week, we must abide with Christ, mindfully refusing to turn away even as He is rejected, condemned, tortured, killed, and buried. The sobering reality of this week is that there is no other way to prepare to behold the brilliant light of the Savior’s resurrection than to face the darkness that led to the Cross, a darkness still all too present in our world and in our own souls. There is so much that tempts us to look for our fulfillment in the false gods of power, pleasure, and wealth. The best way to overcome the threat of such blindness this week is to turn the attention away from ourselves and to the Lord Who stopped at nothing, not even the pit of Hades, in order to make us participants in His eternal life. My recent thought is similar, also in a way Pauline, there is no path to grasp the icon than through the sin of idolatry. The symbol seems always initially a fetish until through enlightenment it is surpassed and then becomes an icon.